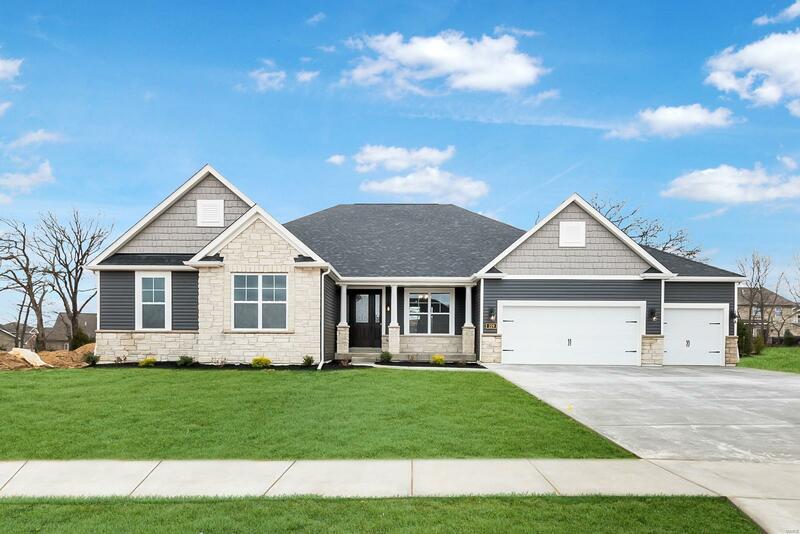 BRAND NEW Lombardo custom ranch filled with upgrades! Luxurious kitchen with a beautiful stone arch, huge breakfast bar island with quartz counters, tall stacked soft-close cabinets with glass doors & roll-out trays, & stainless appliances, including a double wall oven, drawer microwave & 5-burner gas cooktop w/chimney hood. Great room stone fireplace flanked by built-ins. Hardwood floors & 11'/9' ceilings. Master suite has 2 walk-in closets & a spa-like bath w/freestanding tub, separate vanities & seated shower with 3 shower heads! Family bedrooms in their own wing include a princess suite with attached bath. Finished lower level has a rec room w/wet bar, sound system & built-ins, bedroom with walk-in closet & bath. 3-car garage & family entry w/cubby bench to store your gear. Covered composite deck w/built-in speakers. Irrigated yard. Resort-style neighborhood w/pool, walking trails, lakes & more. Wentzville (Liberty) Schools. Too many extras to list! Over 4,000 sq ft! See it today!